Experience the wow factor at the luxurious La Plage campsite. 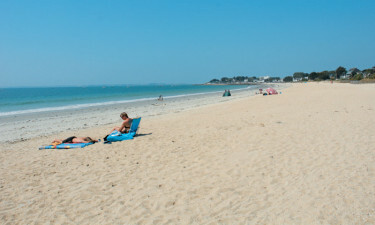 La Plage is a luxury camping site in the region of Finistère on Brittany’s west coast. Just 50 m from the sandy expanse of La Steir beach, it is an idyllic spot for an exciting family camping holiday. Welcome to La Plage Campsite! Why stay at La Plage? The kid’s clubs ensure your children from 5 years old have a wealth of entertainment at their disposal, with activities held both on-site and on Kervilen beach. Creative workshops, nature expeditions, concerts, discos and sports tournaments provide the perfect environment for fun and making friends. 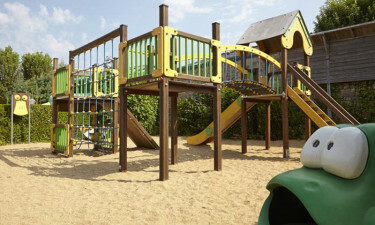 The children’s playground is a garden of colourful delights and there is a mini-golf course. Adults can mix it up with the youngsters over a game of football, basketball, beach volley or tennis. Both hybrid and mountain bikes available for hire. 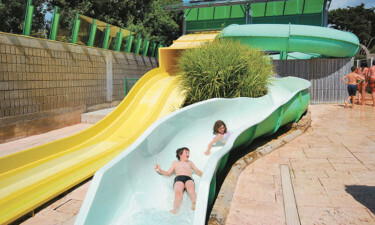 Camping La Plage has a nice swimming pool which is great fun for the whole family. The outside pool is heated. In the children’s pool there is a small slide and a colourful water feature. The older children will definitely enjoy the exciting water slides! If you and your family prefer swimming in the sea then Camping La Plage has a direct entrances to the beach, where you can relax and have fun catching crabs with your children. The lovely port towns of Auray and Saint-Goustan should not be missed. Their charming streets and idyllic harbours are a world away from the hectic bustle of the city. Browse the delightful shops or stop at one of the many bars, cafés or restaurants for a drink or plate of delicious seafood. Children will adore the Parc de Branféré zoo and for even more adventure, try the zip wires at the Forêt Adrénaline. 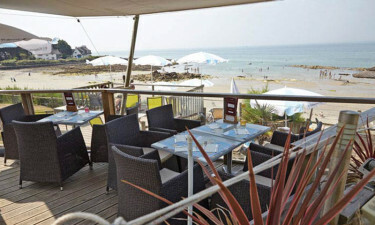 The restaurant serves a range of delicious meals using local, fresh ingredients and its terrace overlooks the beach. Takeaway is also available. The bar is situated conveniently close to the pool complex, so you can enjoy a drink whilst lounging poolside. Fresh bread and all luxury camping essentials can be found in the grocery shop.